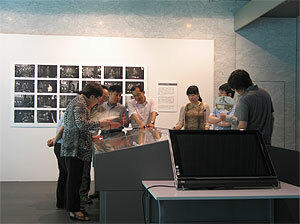 The Department of Art Research, Archives, and Information Systems holds seminars almost monthly. At the 5th seminar that was held on August 30, 2011, Mr. Frank Feltens, a Ph.D student at Colombia University, presented the results of his research in a presentation entitled Rethinking the Relationship between Rimpa and Noh. 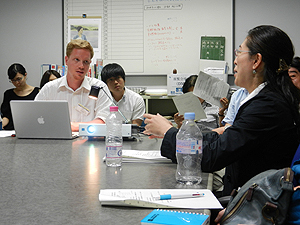 Mr. Feltens came to Japan to serve as a visiting researcher in the Department over about a three-month period from mid-June of this year to early September. OGATA Korin (1658–1716) established his own style of painting by fusing traditional pictorial expression and decorative design. Korin studied Noh drama at starting in his childhood and is known to have had an affinity for Noh chanting that lasted his entire life. Previous research has noted that this art may have had a substantial impact on Korin’s work. In light of previous research, Mr. Feltens’ presentation at the seminar focused on Korin’s motif selection and concept of beauty by looking not just at painted works but also at sources such as crafts, ceremonial dress, and the libretti of Noh dramas. Mr. Feltens utilized approaches such as spatial composition analysis and performance theory to interpret Rimpa art. In a discussion following the presentation, Ms. Izumi TAKAKUWA, head of the Intangible Cultural Properties Section of the Institute’s Department of Intangible Cultural Heritage, noted differences in the bases and techniques of studying the history of the performing arts and art history from the perspective of Noh drama research. Although drawbacks of an interdisciplinary approach became evident, active discussion impressed the need for more definitive validation as part of increasingly varied research on the history of paintings and crafts from the Edo Period. The seminar provided an opportunity for a fulfilling scholarly exchange. The Department of Intangible Cultural Heritage is actively encouraging international cooperation in the study of intangible cultural heritage with several foreign institutions mainly in Asia in accordance with greater momentum worldwide with regard to safeguarding intangible cultural heritage. 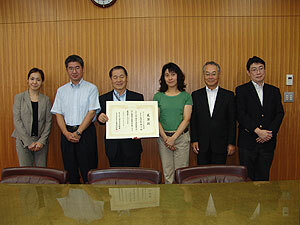 As part of these efforts, the Department concluded an agreement with the Folkloric Studies Division of the National Research Institute of Cultural Heritage, South Korea on Research Exchanges between Japan and South Korea in relation to the Safeguarding of Intangible Cultural Heritage in 2008. International research exchanges have taken place in the 3 years since. Culminating these exchanges was an international conference on the intangible cultural heritage of Japan and South Korea that was held at the Institute on August 9th. Participants included 6 researchers from South Korea. Research presentations on intangible cultural heritage were given by 6 researchers, 3 of whom were Korean. The Department and the National Research Institute also agreed to continue exchanges as part of a 5-year plan starting in 2012. The Department of Intangible Cultural Heritage is conducting joint research with the Tsubouchi Memorial Theatre Museum, Waseda University into the Filmon endless sound-belt, which is a long-playing record invented in Japan. 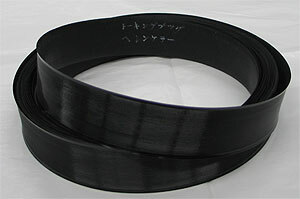 Since this sound-belt was produced only from 1913 to 1915 in pre-war Japan, very few recordings have survived. An audio recording of Helen Keller was known to have been made during her first visit to Japan in 1937, but the actual Filmon sound-belt had long been lost. 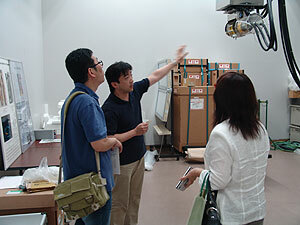 During the course of this research, the sound-belt was found to be in the Osaka University of Arts Museum. This is apparently the only recording of Keller’s voice from her trips to Japan and thus has historical value. The recording was featured in the evening edition of the Yomiuri Shimbun on August 18th. An overview of the Filmon endless sound-belt was presented in Research and Reports on Intangible Cultural Heritage, Vol. 5, published in March 2011. Plans are to describe some details, like what was recorded, in this year’s Report. This year marks the third year of work carried out at Amarbayasgalant Monastery in Mongolia in cooperation with the Ministry of Education, Culture, and Science of Mongolia (MECS) as part of the Networking Core Centers project commissioned by Japan’s Agency of Cultural Affairs. This year, expert teams were sent in late June and late August. In accordance with the topics covered at last year’s workshops, this April the Mongolian government enforced its decision to establish a protected area around the site based on the Cultural Heritage Law. The protected area is vast, including the monastery itself as well as the surrounding landscape, archaeological sites related to the monastery’s construction, and sacred and traditional sites. Specific constraints such as restrictions on development in the area are a major topic this year. 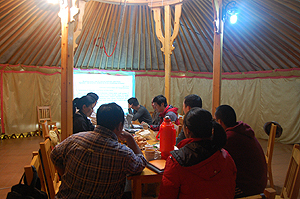 With each team sent, a workshop was held with attendees from the province, district, monastery, and local community in order to encourage efforts by Mongolia’s Selenge Province to formulate plans for site management. Many issues were discussed, among which was the substantial delay in collecting essential information and setting up a framework to formulate a site management plan on the part of Selenge Province. Nevertheless, basic policies to be incorporated in the plan were summarized in recommendations to the province. 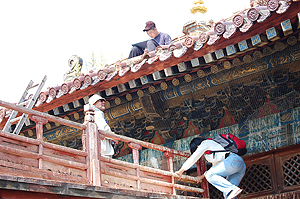 In conjunction with these efforts, the team sent in August included Japanese specialists in restoring historical wooden buildings who trained junior Mongolian conservation specialists in surveys for architectural conservation and restoration. This training is a continuation of that last year and the year before. 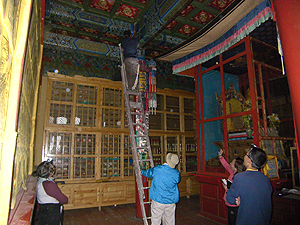 Trainees practiced surveying a temple building that has suffered extensive damage and they participated in steps from quantitatively determining the extent of that damage to preparing estimates of materials needed for restoration work. Historical structures within the monastery are dilapidated and extensively damaged and thus are in quite urgent need of restoration. By itself, Mongolia would have difficulty ensuring the technical standards for restoration. Calls for technical assistance from other countries like Japan are mounting. Discussion with representatives of the Mongolian government must continue in order to find ways to meet that need in the future.